EtherDetect Packet Sniffer is an easy for use and award-winning packet sniffer and network protocol analyzer, which provides a connection-oriented view for analyzing packets more effectively. With the handy tool, all you need to do is to set up the filter, start capturing, and view connections, packets as well as data on the fly. "Simple, easy to use. Inexpensive." "I've evaluated a bunch of network sniffers, but the one I keep coming back to is Etherdetect. Etherdetect isn't free, and it isn't perfect, but it offers the best blend of functionality and ease of use that I've found. Peeking behind the scenes at network traffic has solved some tough performance and debugging problems in our .NET apps. Highly recommended." "As a j2ee/soap programmer, I find etherdetect could display full network data while debugging my programs. It is a bit easier to use than some proxy utilities that display debug info via a log file." Parse and decode a variety of network protocol. EtherDetect Packet Sniffer is a helpful tool for company managers, web page designers, concerned parents, LAN administrators, security professionals, C++/Java/ASP/JSP/PHP/SOAP programmers, or anyone who are interested in network traffic going through their PC or the whole LAN. There are many reasons to use EtherDetect Packet Sniffer. When you develop a network program or a web site, you may need to exactly know what it has sent and received. EtherDetect Packet Sniffer provides you with a way to know all the data transmitted through your network. 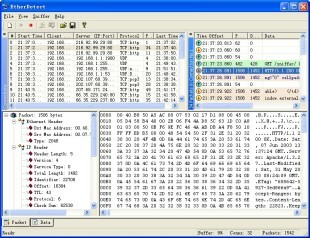 It can save every packet sent by your program automatically, and organize them by connections. Then, you can follow the most concerned packets together. This way you can easily debug your programs, put the focus on the problems, and your development will be greatly accelerated. You can use the packet sniffer as a network traffic logger, and monitor traffic on your network. You may also use it as a Network Intrusion Detection System to discovery hacking attacking through suspicious traffic. As a concerned parent, it is important to know what your kids are doing online. You may also need to detect if your privacy is breached because of "Ad ware" or "Spyware". If you are a student, you can find out how your network is working and get to know the mechanism of each network protocol, such as stmp, pop3, and http, through our EtherDetect Packet Sniffer. Select to capture immediately on startup. Select to minimize on startup. Select to start immediately on Windows startup. Allow user to view generated report directly.